Steve Mackey is a world-renowned guitarist and composer who has written for orchestra, chamber ensembles, soloists, dance and opera. Ahead of two highly-anticipated concerts in Melbourne he talks with the Melbourne Conservatorium’s Dr Ken Murray about his music and the role of the electric guitar in his compositional style. 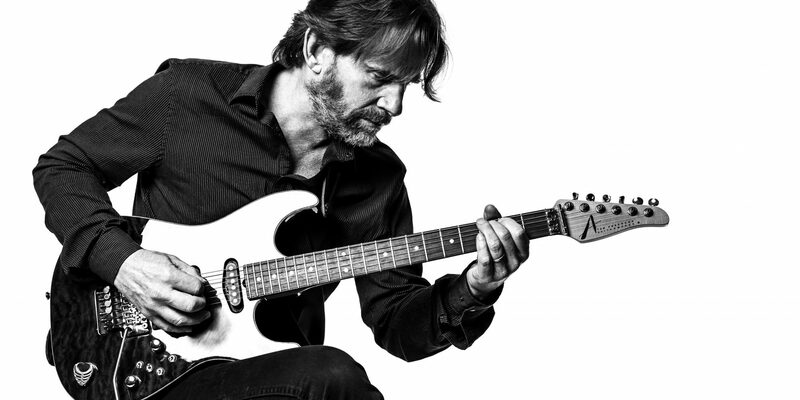 In addition to being a leading American composer, Steve Mackey is a virtuoso electric guitar player who forged a new path for electric guitar in new music in the 1980s and 90s. As an electric guitarist, he performs his own pieces, including two concerti, pieces for electric guitar and string quartet and other chamber and solo pieces. In 2011 he won a Grammy for his piece Lonely Motel, written for the Eighth Blackbird ensemble. This month, Mackey will visit the Melbourne Conservatorium for two concerts, performing with the New Music Studio and MCM Guitar Ensemble to present a program of Australian premieres for massed guitars and mixed ensemble, and a new electric guitar opera, Orpheus Unsung. While at the MCM, Mackey will also be working with staff and students in the composition and performance areas. It’s a privilege to be able to welcome Mackey to the MCM, and I very much enjoyed being able to interview him ahead of his arrival. Steve, you are known as one of America’s leading composers and you manage to keep up a regular schedule of performing – how do you balance those two things? It can be tricky. If I’m deep into the composition of a piece it’s hard for me to switch gears. When I start to practise I often get an idea for the piece I’m working on and drop my guitar to jot it down. For that reason I try to bunch my guitar-playing engagements into certain times of the year so that I will be in tip-top shape only half of the year. In another way, though, they help each other – when I’m practising I often drift off into free improvisation and sometimes stumble onto something interesting which I record and save for the next time I’m staring at a blank page. Also, sometimes I use the guitar to compose, even during a period when I’m not practising regularly. In such cases I think of the guitar the way most composers think of the piano – as a connection to sound, not a guitar per se. Doing so not only keeps my hands in shape, it expands my sense of the guitar and, over time, has brought me to my current orchestral conception of the guitar. As a pioneer of the use of the electric guitar in new music, how has your approach to writing for electric guitar changed over the past 20 years? The biggest difference between then and now is how I approach playing the guitar. Twenty years ago I was a rock guitar-player playing on top of a beat/groove put out by the rhythm section. I’ve had to learn to play inside the beat instead of on top of it. It was quite an eye-opener to rehearse my early works for string quartet and electric guitar. Members of a good string quartet listen to each other, comment on how a phrase is played and tell each other what they need in terms of rhythm, meter, articulation and phrasing. In chamber music everyone makes up the fabric of the rhythm, tying the threads together in an interdependent web. Also, bowed strings have such a dynamic and timbral range and I had to learn to better control my sound with effects. I compose for, and therefore have to practise, pin-point footwork where effects shift at a precise time. I use a volume pedal to increase the dynamic range of the guitar, which is otherwise very limited. One can’t go overboard with effects, though, when playing with acoustic instruments. What may sound good to me while I’m practising can end up making acoustic instruments sound pale, small and dry, and that ultimately damages the music. What is an electric guitar opera? I’m not sure! But it’s a concept that helped me to write music in which the guitar tells a dramatic story, sings arias, and spins out orchestral interludes. In the case of Orpheus Unsung [2 September, Melbourne Recital Centre] the story is the Orpheus Myth. The guitar does everything – it sings arias, plays orchestral interludes, etcetera. I could easily supply words and orchestrate Orpheus Unsung and turn it into a chamber opera. But even without words, I think the narrative arc and details are quite palpable as long as the audience knows the Orpheus Myth. The idea came from a funny piece I did 20 years ago for solo guitarist/narrator called Myrtle and Mint. The premise was that I wanted to write a grand opera but the budget kept getting cut and all that I was left with was a single guitar. There was comedy in how preposterous the premise was, how feeble the substitution was of solo guitar for an orchestra and singers. Orpheus Unsung does the same thing but in a serious way, not highlighting what was missing but making an earnest effort to be an orchestra of sorts. How has the use of harmonics on the guitar influenced your compositional style? Harmonics, particularly off-node harmonics, that produce gong-like multi-phonics are something I’m very interested in. The notes produced can be syntactical – part of a functional harmony – or, because they are so colourful, they can be valuable just as a sound, almost like an exotic percussion instrument. I began to incorporate both functions – harmonics that stood both inside and outside the harmony in my guitar music. That spread to my other music, particularly orchestral music where I would orchestrate the sound of distorted guitar harmonics to use as pure sound objects that contributed to an atmosphere rather than harmony. It’s my personal version of spectralism in that the spectra of an electric guitar is often lurking behind orchestral textures that have no guitar. Steve Mackey will visit the Melbourne Conservatorium of Music for two concerts in August and September 2017 – Composer Portrait Series: Steven Mackey (31 August) and Orpheus Unsung (2 September). Banner image: Steve Mackey. Supplied.